In 1917, the Missouri-Kansas-Texas (MKT, "Katy") railroad funded the construction of the San Antonio Belt & Terminal (SAB&T) Railway (and then leased it for 99 years) to provide switching services among railroads in the San Antonio area. One of the primary customers for the SAB&T's services was the Galveston, Harrisburg & San Antonio (GH&SA) Railway, a property of the Southern Pacific (SP) system that was eventually merged into the Texas & New Orleans (T&NO) railroad, SP's principal operating company in Texas. 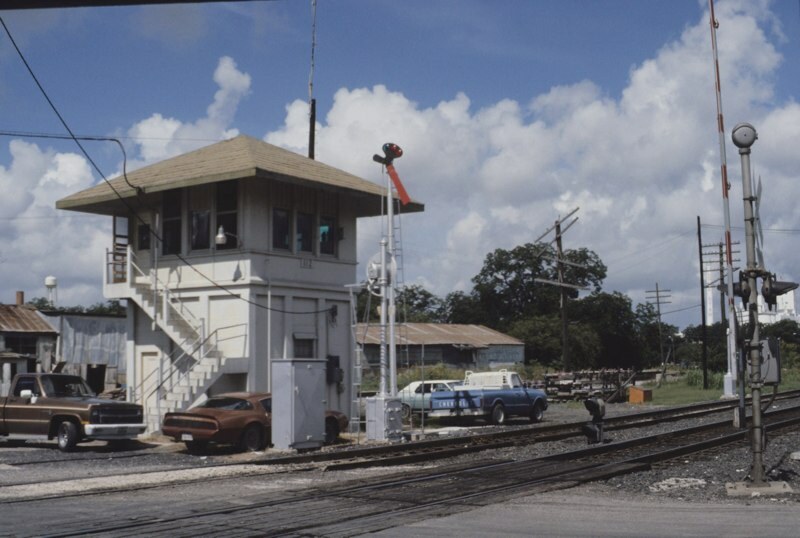 Tower 112 was established on December 30, 1919 as a 39-function mechanical interlocker at a crossing of the SAB&T and GH&SA railroads in southeast San Antonio. 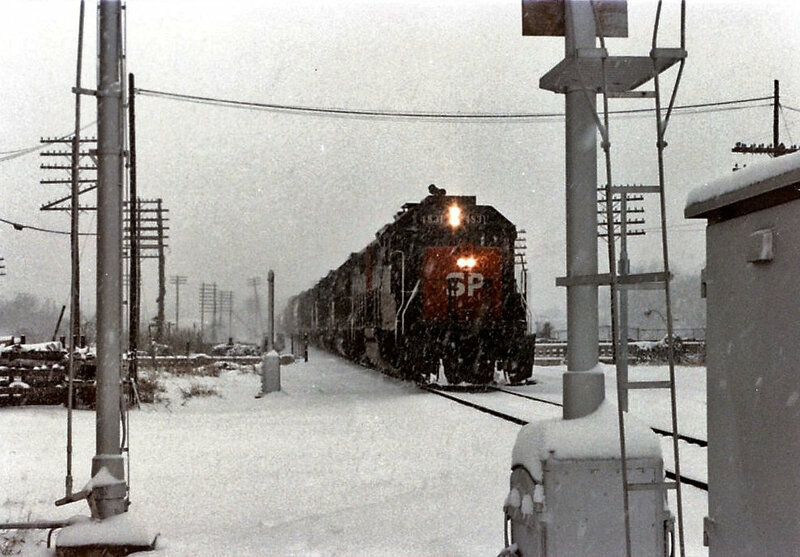 The GH&SA line was (and remains) the famous "Sunset Route", now operated by Union Pacific. "This photo (above) is looking northeast toward Tower 112. The MKT line is in the foreground; the T&NO "Sunset Route" is in the background. Note the searchlight signal and the black and white crossing gates for "old Roosevelt Ave." which was the original alignment of Roosevelt Ave. before the underpasses were built to the west of the photo. Tower 112 and Tower 109 were absolutely identical concrete structures. These are Katy designed towers. 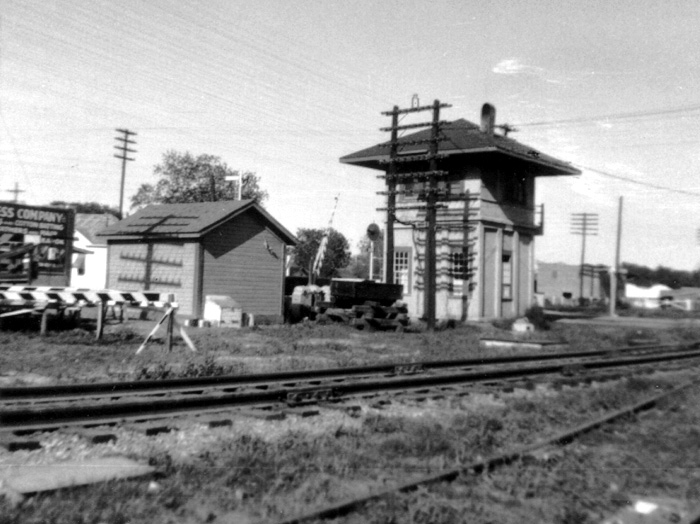 There was a similar smaller concrete tower in Denison (Tower 93) just south of the passenger depot." 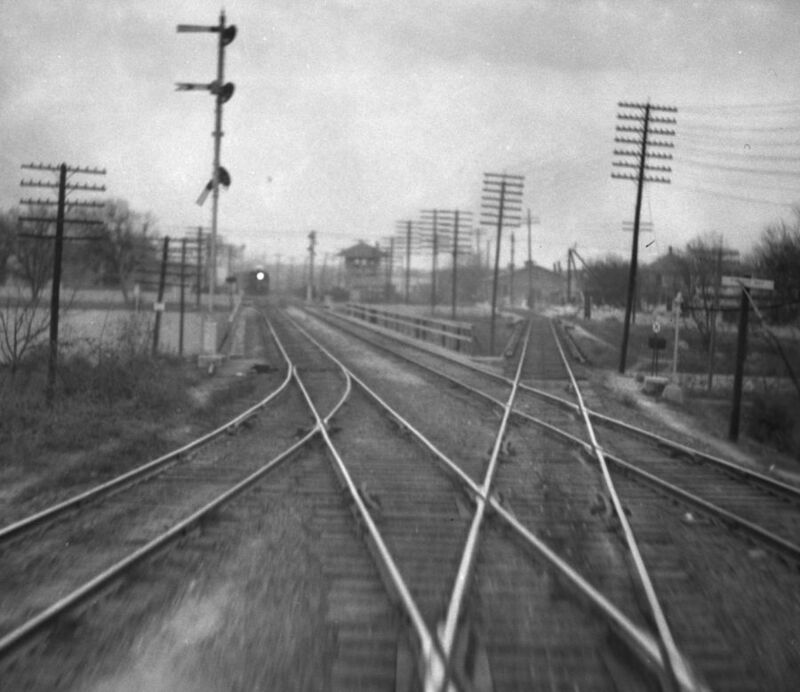 Above: The John W Barriger National Railroad Library provides this image taken by Barriger from the rear of his private railcar in San Antonio in the late 1930s or early 1940s. The camera faces east and the train is technically northbound on the Katy (SAB&T) tracks (but mostly heading west at this point.) Barriger has just crossed the diamonds for the T&NO tracks managed by Tower 112, which is visible in the distance. This gives a stark picture of just how far the tower was from the primary crossing it controlled. The presence of the San Antonio River (which Barriger had crossed just moments earlier) no doubt impacted the selection of the tower site. Below: Another Barriger photo, this one looking back to the west as his train proceeds east on the Sunset Route. 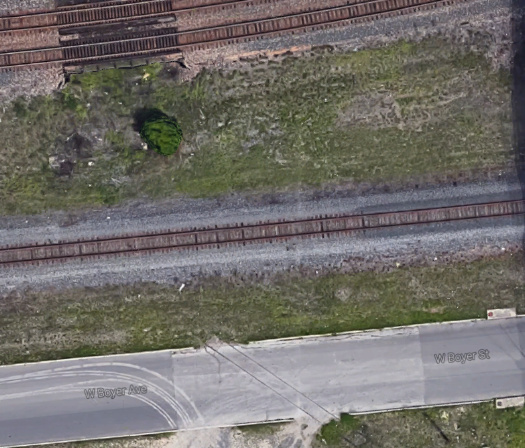 The Katy (SAB&T) tracks are visible at far left. Barriger's car has just passed the Roosevelt St. grade crossing. 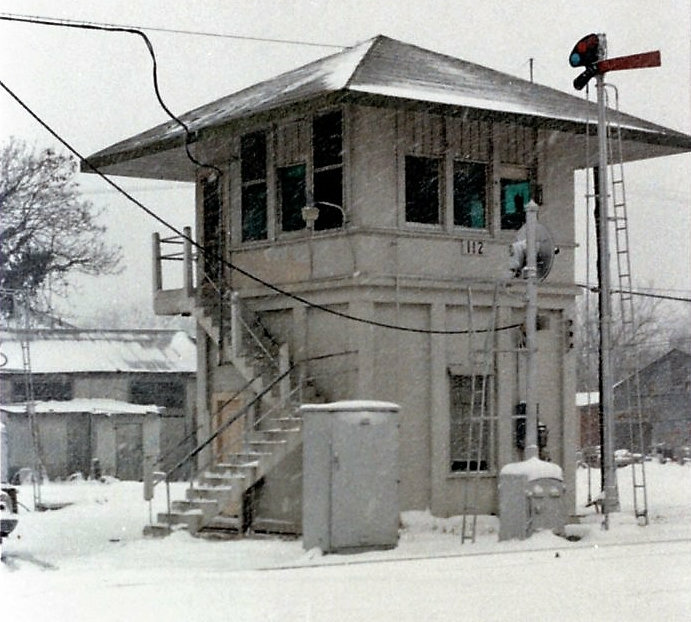 Below: Stuart Schroeder provides these two "snow photos" he took of, and from, Tower 112, explaining..."I worked 2nd trick at Tower 112 on January 11, 12, 13, 1985 during the 13" snowstorm." 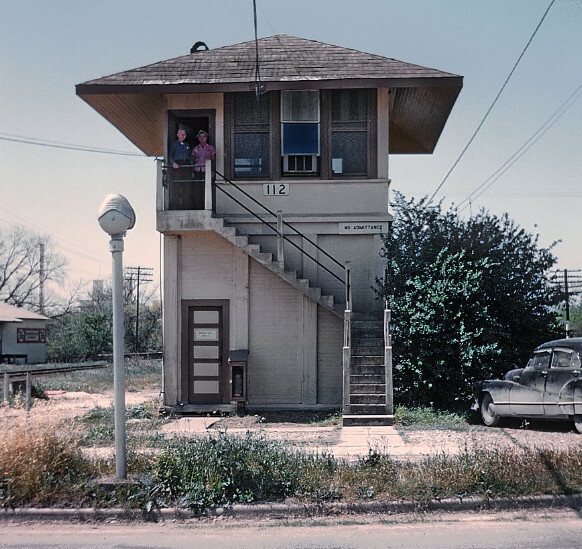 Above: Tower 112 in 1960, photo by Roger Puta. The camera is facing west from Roosevelt Ave. which formerly crossed both railroads at grade. That is no longer the case; the grade crossing was removed and the street barricaded some time after an underpass was built for St. Mary's St. one block to the west. The SAB&T tracks are visible to the south (left) of the tower. A utility pole beyond the trees at right (above the car) marks the Sunset Route. same angle as the above photo. The view below is from ~ 25 ft. further south along Roosevelt. A white smokestack is visible in both images beyond the trees at left. The semi-paved road at left is the SAB&T right-of-way. The tan concrete guardrails for the St. Mary's St. underpass are visible adjacent to the Sunset Route tracks in the distance. on the northeast side of town. "There was a second crossing of the T&NO and MKT near Tower 112 at an industry siding of the T&NO. 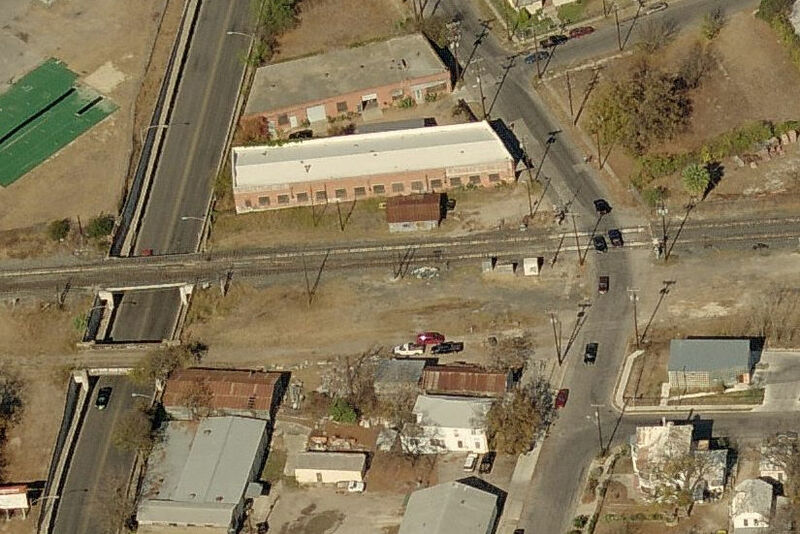 This crossing was located about one block east of S. Presa St., three blocks east of Tower 112 itself. 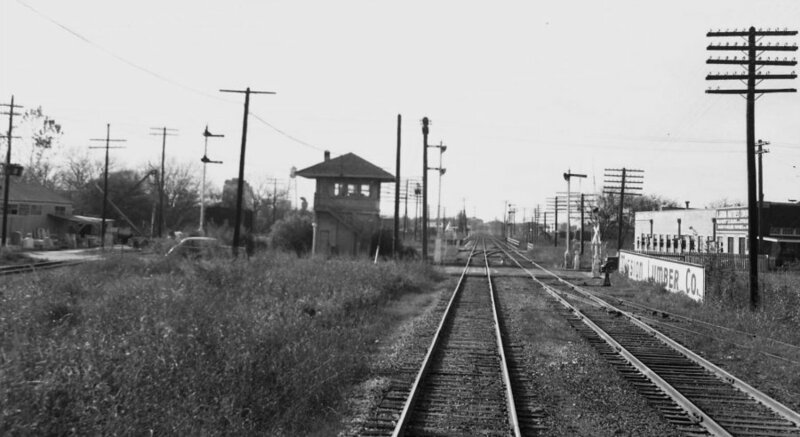 The T&NO siding ran due south from the curve of the double track T&NO and curved across the Katy; the crossing was controlled by the tower operator (inside the interlocking limits of Tower 112). Today, this is just east of the alignment of I-37 on the map. 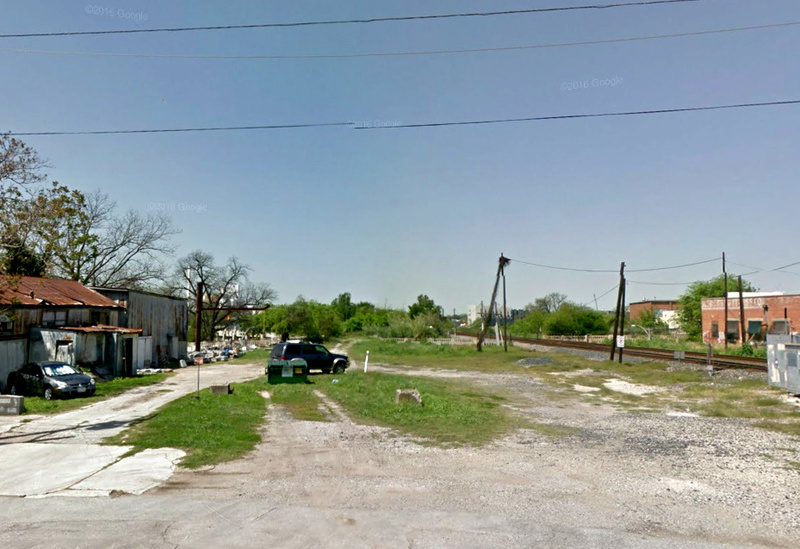 The industry was located one block north of Page Junior High School along Berkshire Street (in the large open space on the map four blocks south of the Katy and one block east of I-37). My mother used to teach at Page Jr. High which was torn down in the early 1950's. I saw T&NO 0-6-0's switch the siding in the early 1950's and Tom Balzen of Austin, who attended Page Jr. High in the 1950's, did too. I spent a LOT of time there in the early 1950's." Matching Tyrrell Kott's observation to available map resources has proved to be challenging, but a possible solution has been identified. Consider the images below reproduced from two USGS topo maps of San Antonio for 1953 and 1967, respectively, along with a current satellite image further below. For context, the maps show a red square at the location of Tower 112. The '53 map does not show any rail spurs at all. This is a bit suspicious...perhaps they did not yet exist or maybe the cartographer was lazy. Or...perhaps the map was actually drawn before 1953 but not published until 1953. If so, then the spur Kott references might have been built after the map was drawn but still in time for his junior high observations in the early '50s (and it would not take much time to build a short spur). Whatever the case, there are several spurs on the '67 map. The green circle is the general location of the industry that Kott observed "one block north of Page Junior High". [Note that Kott's reference to "...along Berkshire Street (in the large open space on the map four blocks south of the Katy and one block east of I-37)" is not a description of the industry location; it is a description of the location of Page Junior High, which he reports was "torn down in the early 1950's". As the '67 map shows, it was apparently rebuilt at the same location, and it continues to exist today as Page Middle School.] The blue circle on the '67 map shows a T&NO spur that "...ran due south from the curve of the double track T&NO...", hence it could have been the spur that Kott references. Although it does not extend far enough south on the '67 map to reach the industry location (green circle), it might have at an earlier time because the building that's in the way ('67 map purple circle) is much smaller on the '53 map and does not have the westerly extension. If the spur originally extended due south and reached the industry location, it would have passed along the west side of the '53 building. South of the building, the spur could have "...curved across the Katy...", i.e. curving slightly to the southeast rather than crossing the Katy at a 90-degree angle. 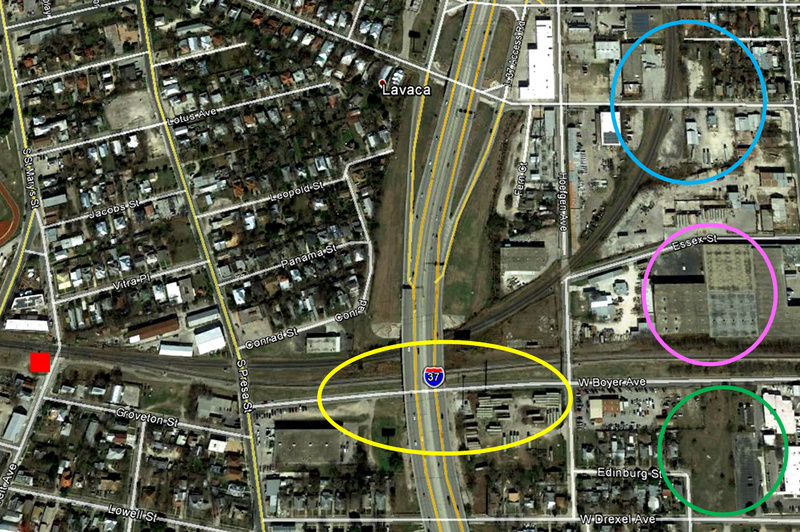 Above: The yellow oval on the '67 map above shows another T&NO spur that crossed the Katy along with an east/west industry track that it apparently served. At an earlier time, this industry track might have extended far enough east to reach the industry location (green circle). Thus, it is possible that for various reasons (e.g. 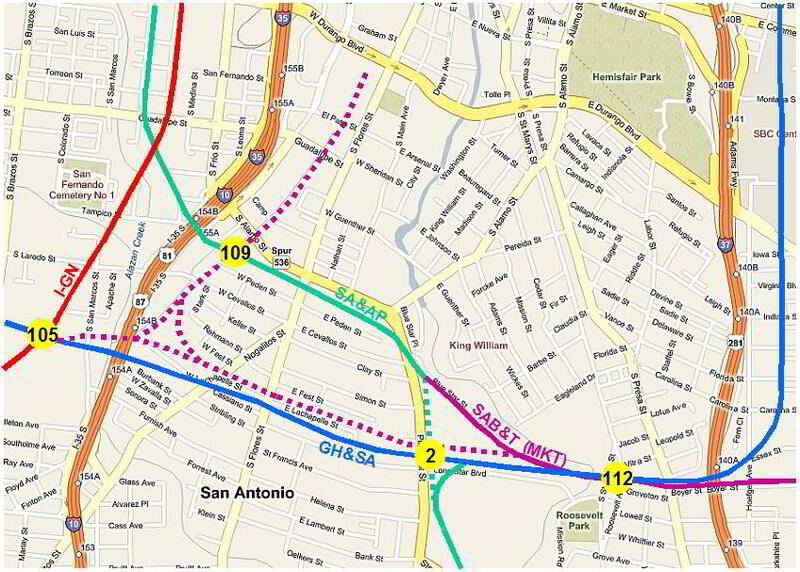 grade crossings, street traffic associated with freeway access), T&NO may have elected to stop serving the industry from the north/south spur (blue circle) and instead, begin serving it from a different spur (yellow oval). Shortening the north/south spur would have permitted the building (purple circle) to be expanded to the west, and could have motivated the SAB&T to build a spur (which appears on the '67 map) to serve that building. Below: The tracks are still in the pavement where the T&NO spur (yellow oval above) crossed Boyer Ave. immediately south of the Katy. This would definitely have been a diamond controlled by Tower 112. Last Revised: 1/22/2019 JGK - Contact the Texas Interlocking Towers Page.